What is Periodontics and What is a Periodontist? Periodontics is the specialty of dentistry that studies the supporting structures of teeth, diseases, and conditions that affect them. The supporting tissues are known as the periodontium, which includes the gingiva (gums), alveolar bone, cementum, and the periodontal ligament. A periodontist is a fully qualified dentist who has undergone additional University postgraduate training (three years full time), enabling him/her to register in Australia as a Specialist in the field. Their level of expertise allows them to provide a higher level of care in the field of treatment of gum diseases, placement and maintenance of dental implants, and associated surgical procedures. Gingivitis is the inflammation of the gums and this occurs when the bacterial plaque that forms on our teeth is not removed by proper tooth brushing and flossing. Gingivitis results in red, swollen, tender gums which bleed easily when brushed or when examined with the periodontal probe. Gingivitis is caused by the accumulation of 'Dental Plaque' in between the tooth and gum surface. Dental Plaque is a colourless sticky biofilm containing millions of bacteria and their by-products, which constantly grow on the teeth, and it is their by-products that trigger the inflammation. If Gingivitis is not treated, it may lead to a more serious disorder referred to as Periodontitis. Periodontitis is the destuctive inflammation of the gums and tissues that support the teeth, it is caused by the presence of Dental Plaque (bacterial biofilm) and the host response to it. If it continues unchecked the infection will spread to the bone in which the teeth are rooted. The bone then resorbs and the teeth slowly become detached from their supporting tissues, the teeth become loose and eventually are lost. Within the infected crevice around the tooth the bacterial biofilm becomes calcified to form a material called "Calculus, Deposits or Tartar". 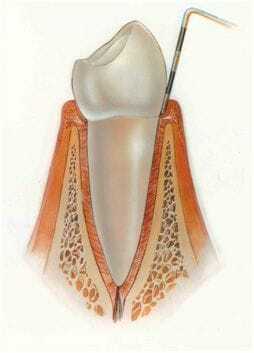 Periodontitis is the major cause of tooth loss after the age of 35. There are also different types and stages of Periodontal Diseases. The gums begin to separate from the teeth, forming pockets which fill with plaque. Toxins produced by the bacteria in plaque continue to irritate the gums. Deeper pockets form as more bone and tissue are lost. The toxins stimulate a chronic inflammatory response in which the body in essence turns on itself, and the tissues and bone that support the teeth are broken down and destroyed. 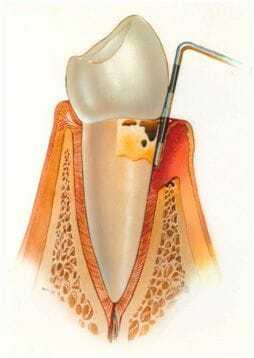 As Periodontal disease progresses, further bone and other supporting tissues are lost. This may lead to the premature loss of teeth as they become mobile or drift. Note how the periodontal probe can now penetrate deeper into the gum tissue. This is usually accompanied by bleeding. What do you need to do if you have periodontal (Gum) disease? It is important that you remove plaque every day and our Periodontists and Hygienist will help you to develop an effective tooth cleaning method, eg. tooth brushing and flossing techniques. 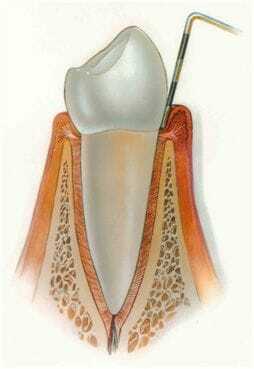 Treatment of periodontitis should not be postponed as periodontal disease will not cure itself. The treatment of periodontitis is to scale and clean the roots of the teeth to remove the plaque and calculus from below the gum line. This is called debridement. The procedure is done under local anaesthesia, with minimal discomfort. The end result is a smaller periodontal pocket, healthy, firm gums and fresh breath. Such debridement removes the cause of the periodontal infection and thus results in healing. In some cases this debridement may take several appointments to complete and occasionally periodontal surgery may be required. Some times antibiotics and antimicrobial agents are indicated. 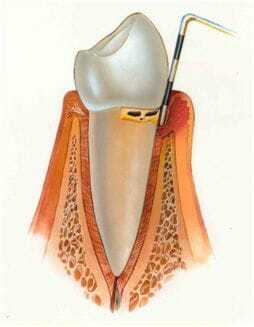 Extraction of affected teeth may be necessary if the lesion is too advanced. In such cases implant therapy could be considered for their replacement but only once the periodontal condition has been treated and is under control. Long term success of periodontal therapy is dependent on the patient carrying out good plaque control and visiting the Periodontist/Hygienist for regular professional cleaning and reassessment. These maintenance visits are important because if the bacteria that causes periodontal disease is allowed to regrow the disease will recur. Like other chronic diseases (such as diabetes or high blood pressure), periodontal disease requires regular monitoring and removal of build up. The goal of periodontal supportive therapy is to prevent re-infection and detect any disease progression. Your Periodontist will prescribe an individually tailored maintenance program. This maintenance program typically involves an updated medical and dental history, an examination of the current oral and periodontal (gum) conditions, a full mouth cleaning and polishing, and oral hygiene reinforcement. Your periodontist will also identify other risk factors that may be contributing to the periodontal disease and discuss the appropriate management. When the periodontal (gum) conditions have been stablised, the maintenance program can be performed by your dentist or hygienist. In deep periodontal pockets, the overlying gum can restrict the movements of the instrument, hinder access to the root surface and limit visibility of the plaque deposits and calculus. This makes cleaning at home with a toothbrush next to impossible and compromises the success of conventional scaling and root debridement. The aim of surgical periodontal therapy is to provide direct access to the root surface and underlying bone by retracting the gum tissue. This allows the Periodontist to visualise the infected tissue and clean the site thoroughly, thereby removing the source of infection, reducing the pocket depth and improving the contour of the tissues surrounding the tooth. 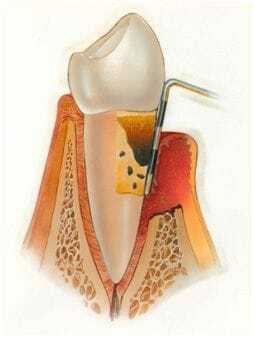 When the bacteria, dental plaque and calculus have been removed, the gums are closed back together and secured with sutures, those dissolve so they don't need to be removed. Surgical periodontal therapy is performed under local anaesthesia and tolerated very well by most people. Dental Hygienists are uniquely qualified to assist in the prevention, supervised treatment and maintenance of patients who have been treated for periodontal disease. Focusing on periodontal health by monitoring oral hygiene practices and assisting the patient to develop a home care plan to maintain oral health, as well as performing periodontal maintenance, our Hygienist will give specific advice on prevention and oral hygiene techniques, in order to achieve and maintain optimum oral health. As every patient is different, a personalised description and explanation of the periodontal treatment requirements is discussed with the patient. Our Periodontists confer closely with our Hygienist when prescribing individual treatment needs for each patient. It is our aim at Periodontics & Dental Implant Centre that through preventive advice and treatment, our patients will achieve and maintain optimum oral health. In almost all instances, when patients are well motivated to carry out proper oral hygiene and present for regular maintenance appointments, their teeth can be maintained for life. Crown lengthening (gum lift) is a surgical procedure performed to expose more tooth structure for aesthetic and/or functional (restorative) reasons. A crown lengthening procedure may be performed to correct short teeth, excessive gingival coverage (gummy smile), or uneven gum contouring (aesthetic reasons). It may also be performed to correct subgingival caries (decay) or subgingival tooth/restoration fractures, both of which cause inflammation of the surrounding tissues and make oral hygiene more difficult. Crown lengthening involves reflecting the gingival tissue from around the teeth being lengthened, recontouring the underlying bone and then re-adapting the gingival tissue into its new position. The end result is balanced, symmetrical and functional gum contouring, natural tooth length and restored teeth that don't compromise the natural architecture of the gingival attachment. Crown lengthening procedures are performed under local anaesthesia. This procedure is often performed on unerupted permanent (adult) tooth/teeth prior to orthodontic treatment. Frequent causes for tooth/teeth uneruption include: loss of space within the dental arch; over-retained deciduous (baby) tooth/teeth; blocked path of eruption; lack of eruptive force; or unknown reasons. The solution is to expose the unerupted tooth so that the orthodontist can move the tooth into the correct position. Surgical tooth exposure is a minor surgical procedure, which is well-tolerated by most people under local anaesthesia. This procedure is performed to remove an abnormally positioned frenum (muscle attachment). In some people, a frenulum may interfere with routine oral hygiene and may cause gingival recession, diastema formation, increased plaque accumulation and limited tongue movements. A frenectomy involves releasing the frenulum from the surrounding tissue under local anaesthesia. The word frenum, or frenulum, describes the tough tissue that attaches any organ to the its neighboring tissue to prevent it from moving too much. Think of it as a kind of tether to limit movement. In some cases, the frenum is too short, tight or tough. A frenectomy is a term used to describe the removal the frenum, but in the case of a very young infant, it may be possible to just clip it. Common frenectomies involve the tongue and lips. The inhibited movement causes difficulty with regular tasks like eating and talking, or hurts proper development in children, leading to aesthetic problems. The frenectomy is the simple procedure by which the frenum is severed to free up more movement. It's a low-risk, outpatient procedure that is usually successful the first time in solving the problem. Sometimes a high frenum could cause gum recession or diastemas in between teeth. Labial Frenectomy (upper lip): A labial frenectomy most often involves the frenum attaching the upper lip to the maxilla, usually in children as their teeth and gums develop. The problem of the upper labial frenum is primarily one of aesthetics, but not necessarily. If the frenum is too short or tight, there are a few common issues. For one, the ligament tissue can extend toward the two upper front teeth and cause a diastema, or gap in between the teeth. It can also cause gum recession. Lingual Frenectomy: The lingual frenum is the tight cord underneath the tongue that holds the tongue in its resting position. In most people, there's sufficient flexibility that the tongue can move around and perform its functions for speaking and eating. But again, if it's too tight or short it holds the tongue too low. This is commonly referred to as being "tongue-tied," it could keep the tongue from pressing properly against the roof of the mouth during swallowing, pressing it instead between the teeth and preventing the bite from closing all the way over time. Finally, being tongue-tied is a common culprit for lisping. There are a few different ways to perform a frenectomy, but they are all fairly low impact and heal quickly. The most basic frenectomy procedure is done with a scalpel or scissors. The immediate area will be numbed usually with a local anesthetic. Then the doctor uses an incision to release the frenum and excise it. Once excised, the wound is either left open or sutured with resorptive sutures. The benefits of a frenectomy are usually fairly immediate and positive. The procedure itself takes only a few minutes usually, and will cause discomfort for just a couple of days. The site will usually heal in a couple of weeks. As with any surgery, there are some risks. For one, there is the possibility of the surgery not being sufficient and needing to be redone. Or the frenum may reattach. This can be prevented by doing exercises by pulling the lip to prevent reattachment during the first two weeks after the procedure. There's also a small possibility of excessive bleeding and post-surgical infection. In addition, following a lingual frenectomy, there may be a need for speech therapy exercises to train the patient to properly use the tongue, once it's been freed and has newfound mobility. After the procedure, the area will look like a large sore, and there may be slight bleeding, but this is generally not cause for concern. If there is bleeding, simply fold a piece of gauze and place it on the wound to soak up any blood. It's important to keep the area clean by gently applying an antiseptic gel on the wound. Patients will require stretching of the lip 5-6 times a day for two weeks following the procedure to prevent reattachment of the frenum.